The first thing we recommend is that you purchase a pad. Most rugs require a 2 sided felt and rubber pad to put underneath your rug. This will keep your rug from sliding around, and give it cushion to eliminate crushing the fibers which can cause premature wear, and will help retain its original appearance longer. Rotate your Oriental Rugs as often as possible (1-2 years), when you notice the high traffic areas of your rug starting to look dirty, or the nap has lost its original direction or shape. Rotating your rugs will allow them to wear more evenly, maintaining their original appearance and value. Also, rotate your rugs according to the amount of direct sunlight. Over time direct sunlight can fade the dyes of your rugs. Vacuuming is the best way to remove everyday dirt and dust. Special care should be taken in the fringe area as vacuuming with a beater bar can catch and pull the fringe, causing permanent damage. How often you should vacuum depends on how much traffic there is over the rug. In highly traveled areas you may need to vacuum as often as once a day to keep soil from accumulating. Vacuum your Oriental rugs regularly, being sure to go back and forth in the same direction & repeating in different directions to vacuum over the entire rug (avoiding the fringes). A thorough vacuuming is actually 7 or 8 times in different directions. If you are vacuuming with a beater brush, we suggest you set the brush so it just touches the top of the pile and moves easily across the rug. When vacuuming with a carpet tool, ease the suction of the vacuum by adjusting it accordingly. Be sure to periodically vacuum the back of the rug using a beater bar to knock the sand and soil out of the knots. Certain stains such as coffee, colas, juices, animal, medicines, milk, foods and certain dyes should be spotted immediately for best results. Blot, never rub or scrub a spill. You will only force the spill deeper into the fibers and most likely damage the tips of the fibers. Remove any solid materials from the area, by using a spoon or knife. Scrape inwards towards the spot whenever possible. Press a white towel or paper towels gently on the stain until it is absorbed. Set a heavy object over the towels to absorb as much moisture as possible before trying to remove the spot. Try to remove any residual stain by blotting with warm water containing a SMALL amount of wool carpet shampoo or dish soap , repeat to rinse with clear water and finish with diluted pure white vinegar. The vinegar will help prevent cellulose browning from being over wet & maybe not drying fast enough. When considering having a rug repaired, evaluate the cost of the repair to the value and your personal attachment to the rug. 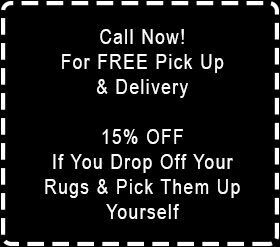 Only allow a reputable and knowledgeable craftsman/weaver to restore or repair your Oriental Rugs. The most common repairs are re-fringing and over-rounding the side cords. We suggest re-fringing, where the weaver will use the selvage or a minimal part of the rug, rather than adding a fringe to the rug if possible. If there isn’t enough fringe left without going into the design, a new fringe can be added by setting it on top of the existing fringe and sewn on by hand. Either way the edge needs to be secured to prevent it from further damage. When the entire siding of the rug needs to be repaired, the weaver either over-rounds by hand or by sewing a cord with a matching color to the sides. We would suggest repairing the rug the original way it was made. Make sure that the weaver is able to match the wool color. The colors used in Persian rugs should be easily matched but matching the colors in an old Chinese carpet may prove to be more difficult. If you plan to store your Oriental Rugs, we suggest having them cleaned 1st and wrapped in Tyvek paper to protect your rug from weather as well as rodents and insects. Tyvek is a breathable non tearing paper, great for safely storing rugs. Moths and carpet beetles can destroy an Oriental Rug. Check the edges and area of your rug under furniture for any infestation. Act immediately if you see any bugs or eggs. You will probably need to have your entire house sprayed and all wool rugs cleaned. Check your wool clothes if there is a problem. We can add a moth preventative after cleaning. No chemicals, just plant by-products that the insects don’t like the taste of. It doesn’t kill but when they have nothing to eat they die naturally or leave.